"Neither Brisc Rubal nor the other players implicated in this incident breached CCP’s confidentiality, the terms of the Non-Disclosure Agreement, or used privileged information to obtain an in-game advantage." Following on from our statement on April 17, we have completed our review of the Brisc Rubal investigation and determined that our initial findings were incorrect. Neither Brisc Rubal nor the other players implicated in this incident breached CCP’s confidentiality, the terms of the Non-Disclosure Agreement, or used privileged information to obtain an in-game advantage. We made a mistake here and we offer our formal apologies. First, to Brisc Rubal and the two other players involved, both for making the allegations and for the disturbance and stress caused by the way in which we handled this situation. Second, for not collaborating with due care with the members of CSM 13, who have acted responsibly throughout. Lastly, we owe our sincere apology to the EVE community for this error. We take full responsibility for any confusion and mistrust caused by our initial assessment of the situation. After reviewing our assessment of the information on which these allegations were based and having spoken repeatedly with everyone involved, it’s now clear that our initial actions were based on unsubstantiated assumptions. While we were motivated by a desire to protect the working relationship between the CSM and the EVE Development Team with all due speed, had we taken the time to review the information with greater scrutiny, this incident could have been resolved without the disruption that has since occurred. We aim to make it up to all concerned. Right now, we are in the process of restoring access to the EVE Online accounts of all three affected players, returning any confiscated assets and providing rectification as appropriate. We will work to set this right and will be making changes to our procedures and policies to ensure this kind of situation does not reoccur. Honestly, I figured if Brisc had committed a breach of the NDA he signed, the breach was totally accidental. I was also a little irritated to discover CCP had not adequately investigated the matter before taking punitive steps against the INIT 3. I thought that the procedures included a reference to Internal Affairs to double-check on all charges. I guess not, which is strange since CSM members are supposed to receive the same type of attention CCP employees receive. At least, that's what I've gathered over my years covering the player-elected group. In the wake of the decision, Brisc decided to resign from the CSM. I collected a few statements he issued today on Twitter. I know it would be easy to be angry and want to go after whoever accused me, but I'm not going to be vindictive. It was a mistake, it's been rectified and I don't want anybody else impacted by this - I know how bad it was for me, I can't in good conscience do it to somebody else. For those wondering, Open Comms is on the Imperium News Network Twitch channel at 9pm Eastern, 6pm Pacific Friday, or 0100 EVE time on Saturday. I'm sure Dreydan will have an appropriate opening for the show. In closing, I do have a few other questions I'd love to know the answers to, but I know I'll never find out. Which, is appropriate. We've seen enough information flying around, and much of it was wrong. We don't need any more. Having played EVE Online for nearly a decade, I appreciate some of the simple things. One of the greatest innovations CCP made to the game was the skill queue. When the game launched in 2003, characters could only train one skill at a time. No queuing another skill to start immediately upon completion of the learning of the first skill. This led to trying to time the end of a skill's training time during a player's normal play time or setting an alarm clock to wake up in the middle of the night to start the next skill. Yes, every skill point mattered, even in 2003. By the time I started playing in 2009, the mechanics had changed a little. CCP had instituted a 24 hour skill queue, meaning that as long as a character had less than 24 hours of skills training, additional skills could be added. No more waking up in the middle of the night to maintain an EVE account. If not for changes to jump drive ranges and the introduction of jump fatigue, the Phoebe release in November 2014 would have gone down in EVE histaory as the introduction of the 50-skill queue. Gone were the days of players needing to check their skill queues every day (or every week). I personally made a skill queue 2 1/2 years long. 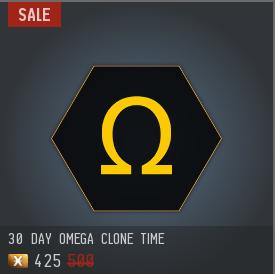 Of course, once Alpha clones were introduced, the 50-skill queue was reserved for Omega accounts while Alphas received the old 24-hour skill queue. Elder Scrolls Online has its own version of time-based skill training in the crafting system. In the base game, some of the best gear was crafted, like the Kagrenac's Hope armor set I'm working on now. Each piece of crafted gear has an innate ability, or trait, that a player can add to the piece during the crafting process. In order to create the crafted set gear, a player needs to know how to create gear with a certain number of traits. The Kagrenac's Hope gear requires the knowledge of 8 traits for each piece of gear, while the Torug's Pact set (which I use for my weapons) only requires the knowledge of 3 traits. To learn a trait, the player has to do two things. First, obtain a piece of gear with the desired trait. Second, go to a crafting station and research the trait. The researching process destroys the item (so don't research an item you wish to use) and then requires a wait. How long a wait? Much like EVE, the training time depends on how many traits the character already knows how to craft into a weapon. ... where n is the number of traits already known on the piece of gear. So the first trait takes .25 days, or 6 hours to train, while the 9th trait takes 64 days to train. Zenimax did provide a few ways to reduce the time. Each crafting profession has a passive skill line that not only allows the researching of multiple items, but shortens the research time as well. The final level of the skill prevents research times from exceeding 30 days, which is a welcome skill when researching the 9th and final trait on gear. Now, in true free-to-play fashion, Elder Scrolls Online provides plenty of ways to speed up the research times using real life currency. The first involves the ESO Plus optional subscription. In addition to all the other perks, having an ESO Plus subscription speeds up research times by 10%. The next items are research scrolls. Zenimax gives out scrolls with the daily rewards to get people hooked. I hear that the Master Writ merchants sell 1 day scrolls also. But the other way to get the scrolls, and the really powerful scrolls, is to visit the cash shop. In the cash shop, a player can purchase scrolls that will reduce the training time by 7 or 15 days for all items being researched in a single profession. The 15 day scrolls cost 5000 crowns, or 50 more than a player gets for a three-month ESO Plus subscription. Yes, in addition to the 10% reduction of researching time, ESO Plus members also get crowns to purchase time reductions. Did I mention the ESO Plus subscription is worth getting? For those wishing to purchase more, the 5500 crown package costs $39.99 when not on sale. For EVE players, that equates to an exchange rate of 5 crowns for 1 PLEX. So, for example, if a dedicated crafter wanted to train a 9th trait on all clothing items when Summerset came out, it would have cost 40,000 crowns for the instant research scrolls. In real life cash, that comes out to $294.92 (7 5,500 crown packs and 1 1,500 crown pack). Assuming, of course, the player had maxed out the passive skills on the character performing the research. Finally, I get to the inspiration for this post. Elder Scrolls Online really needs a research queue so I can put in all my research. As I often do, I type these posts on the train, and I really just want to log in and start researching the next item. Instead, I have to wait until I get home and waste 6 hours of potential research time. I'm not so far gone that I'd stay home from work just to set my research queue, although I could if I really want to. I realize that, like with training my mount, logging in to maintain my crafting research queues is a way to keep me engaged with the game. But maybe Zenimax could add a queue to the cash shop? I'd probably buy that. "THE CONTENTS OF THIS DEVBLOG ARE OUT OF DATE. WE ARE CURRENTLY CONDUCTING A FOLLOW UP INVESTIGATION INTO THIS MATTER. "YOU CAN READ THE LATEST INFORMATION IN THIS INTERIM STATEMENT FROM THE COMMUNICATIONS TEAM." On 9 April, Brisc Rubal was removed from the Council of Stellar Management for a breach of the CSM non-disclosure agreement. CCP announced that Brisc revealed confidential information to a strategic-level fleet commander in The Initiative., with the information later falling into the hands of a second strategic-level fleet commander who then profited from the information. From the description provided in the original dev blog, Brisc said something to someone, who then said something to someone else, who then used the information to play the market. I think those familiar with the situation figured that Brisc probably asked a knowledgeable person in his alliance about some aspect of the game and thought he had done it in a clever enough way to avoid disclosing what CCP's upcoming plans were. The other individuals involved, being clever people themselves, figured out that Brisc was asking about something CCP planned to do in the near-term future and one of them acted upon the information. Nothing malicious, but a bad event all the same. "Last week, on April 8 2019, we announced the permanent banning of Brisc Rubal and their ejection from the Council of Stellar Management. We also issued one-year bans to two other players involved in this incident and confiscated their associated in-game assets and ISK. "Following this statement, we have held further discussions with the affected parties. We have also been conducting an internal review to substantiate the evidence available to us and evaluate our handling of the situation. We intend to share a full follow-up statement next week. "Transparency, fairness and trust is of utmost importance to us, which is why we’re issuing this brief update while also taking the time to ensure that we conduct a thorough investigation. We understand that there are many questions lingering over the incident, and we want to assure you that we take this matter very seriously. Both the sanctity of the CSM and the relationship we have with our players is of paramount importance to CCP. I learned a lot of technical language when I served in the Army appropriate to describe what I read in the latest dev blog, but I'll try to keep this to a level a layman can understand. If CCP is going to level charges of real-world misconduct, I would hope they would have conducted an adequate investigation before taking the actions they did. According to the statement, CCP failed to do so. If I had to guess, the source of the allegations probably led CCP to not look into the situation as closely as they should. Here are the quotes that lead me to believe this is the case. "To be fully transparent, this misconduct was brought to us by the CSM themselves as an immediate threat to the integrity of the CSM as an institution." "We would like to take the opportunity to thank CSM 13 for their transparency and their respect for the council as an institution, which was demonstrated by their coming together to condemn this kind of behavior and report it to CCP." Of course, the involvement of other members of the CSM potentially opens up another can of worms. What if someone decided to weaponize CCP in order to settle some grudges or gain an in-game advantage by taking out important members of The Initiative. 's command team? Yesterday's news opens up that possibility. One that I hope is shut down fairly quickly. Now, I do need to take note of the people asserting that Pearl Abyss needs to step in and clean up the mess. I think CCP's parent company is a little busy trying to figure out exactly what went wrong with its ban wave that apparently caught up hundreds of innocent players. The situation with cheating in Black Desert Online's Shadow Arena battle royale mode was so bad that Pearl Abyss ended up removing the feature from the game. Remember when Hilmar and CCP's communications team stated one of the reasons Pearl Abyss purchased CCP was the Icelandic studio's experience? We've recently seen Pearl Abyss needs it. We get another dose of CSM investigative news next week. Hopefully, the next dev blog on the matter is the last. Up until this month, CSM had done nothing to embarrass itself. No matter the outcome of this latest kerfluffle, CSM 13 received a stain that will remain with it forever more. One of the more amusing sights in EVE Online is the conflict between Pandemic Horde and Test Alliance Please Ignore over the citadels in Perimeter. Well, the effort of null sec entities fighting over a high sec system is amusing until one realizes the prize is control of the PLEX trade in New Eden's main trade hub. In the first quarter of 2019, almost 550 trillion ISK worth of PLEX was traded in The Forge, with the citadels playing a huge roll in the sales. Even if a player entity could charge a 0.1% tax on PLEX transactions in The Forge that would amount to nearly 550 billion ISK over a three month period. No wonder TEST plopped down a keepstar in high sec. The types of numbers the players are fighting over are nearly incomprehensible. According to the information I pulled from the market ESI, over 296,000 months, or nearly 24,700 years, or Omega (aka subscription) time was traded in the first 3 months of 2019. That's almost 3,300 months of Omega time a day, or enough to pay for 100,000 subscriptions every month. 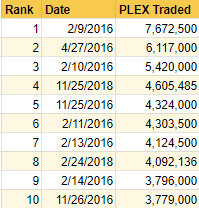 I realize that much of the PLEX sold on the market is either flipped or held as an investment, but even 50,000 accounts utilizing PLEX to pay for game time is a lot of accounts paying to play "for free". Also, a lot of people paying for ISK using real life money. Even when converting the data to time, the numbers are still mind-numbing. So instead, I thought I'd make a few graphs with information gathered from the first three monthly economic reports for 2019 to try to visually show how big the PLEX market in The Forge is compared to the overall New Eden economy. 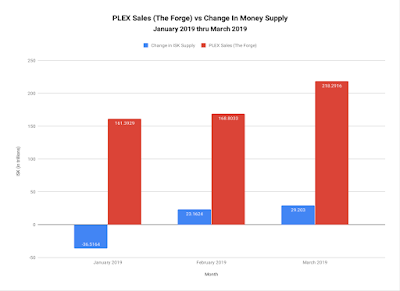 The first graph shows the value of PLEX sales in ISK vs the monthly growth in the game's money supply. Don't confuse the figure with the Active ISK Delta, which is the amount of ISK entering the game on returning players' accounts subtracted from ISK leaving the game on departing players' accounts. The above graph shows the entire change in the money supply in a month, including the Active ISK Delta. 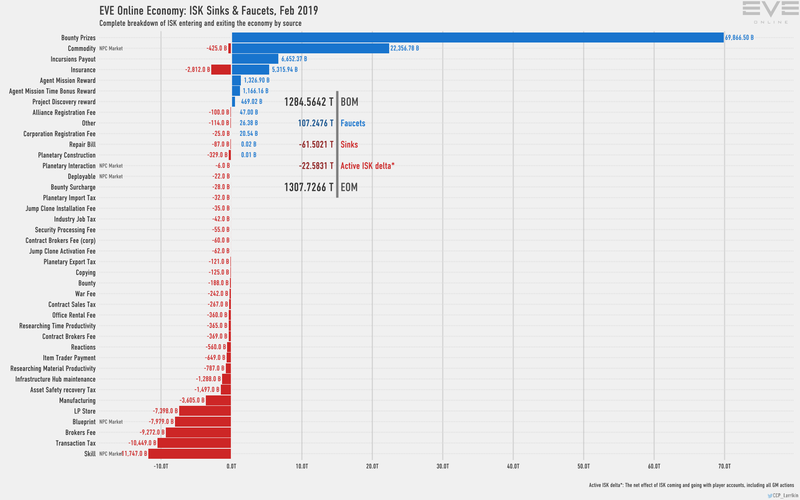 In the first quarter of 2019, the money supply grew 15.8 trillion ISK, or by 1.2%. The value of the PLEX sold in The Forge over the same period of time, 548.6 trillion, was a remarkable, at least to me, 34.6 times the growth in the money supply. 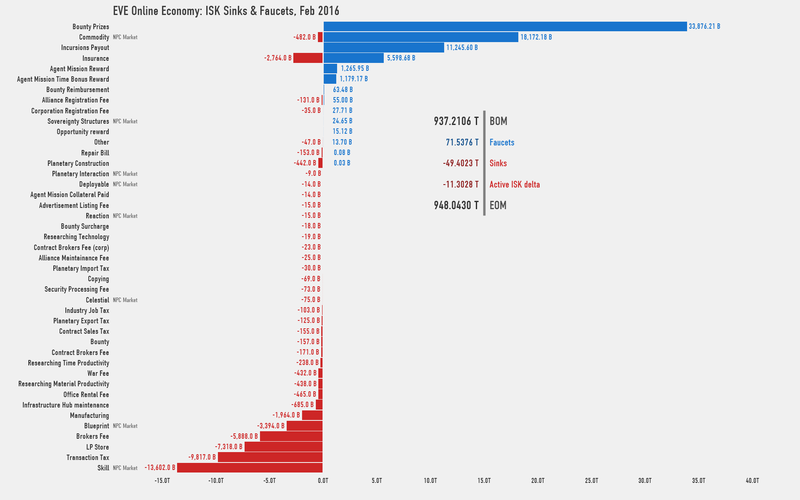 If the PLEX market dwarfs the growth in the money supply, then what about the biggest ISK faucet in the game, bounties. Many players in null sec plop a Vexor Navy Issue down someplace and walk away from the keyboard, letting the ship's drones do the work of making ISK. I doubt the above graph comes as a surprise to null sec players, especially Rorqual pilots, but the amount of ISK earned ratting does not cover all the PLEX traded in The Forge, much less the entire game. 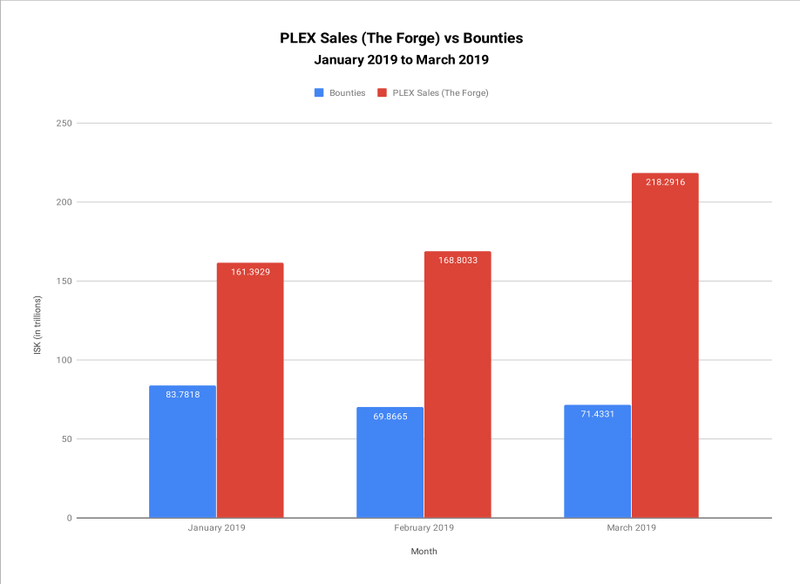 Yes, the 225 trillion ISK in bounties in the first three months of 2019 could have covered the losses of 20 battles the size of B-R4RB, but still only was 41% of the value of PLEX traded in The Forge. How does the PLEX market in The Forge stack up against all the ISK faucets in EVE? There, the numbers are more comparable, with the PLEX market only 1.5 times the value of all ISK faucets in the first quarter of 2019. The numbers are skewed by the sale at the end of March, which lead to all the consternation about game time becoming unaffordable. 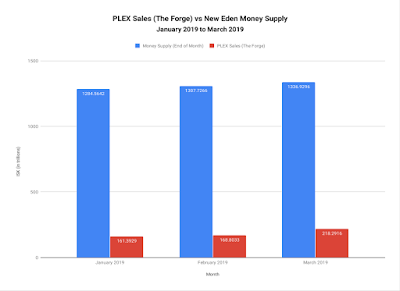 In March, the value of PLEX sold in The Forge was 1.8 times the value of all ISK faucets in New Eden. At this point, I couldn't blame a reader for asking, "Is there anything the PLEX market in The Forge doesn't dwarf?" The big thing, of course, is the total money supply. 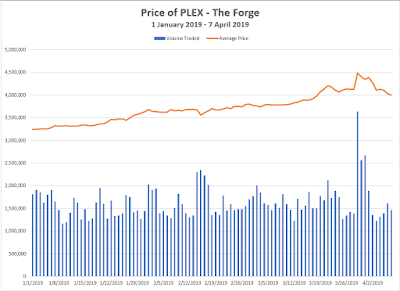 In January and Feburary, the PLEX trade in The Forge was worth between 12.5% and 13.0% of the money supply. The end of March trade that members of the CSM were upset helped raise that figure to 16.3% in March. Hopefully, I've explained at least one reason why two major null sec entities would want to war over citadels in high sec. The amount of ISK involved is staggering. Is the trade which is a sanctioned way for players to purchase virtual currency, healthy for the game? I'll leave that up to people who know the economy far better than I? "A correction is generally defined as a 10 percent or greater decline in the price of a security from its most recent peak. Corrections can occur in individual stocks, indexes, commodities, currencies or any asset that is traded on an exchange. An asset, index, or market may fall into a correction either briefly or for sustained periods of time, including days, weeks, months, or even longer." 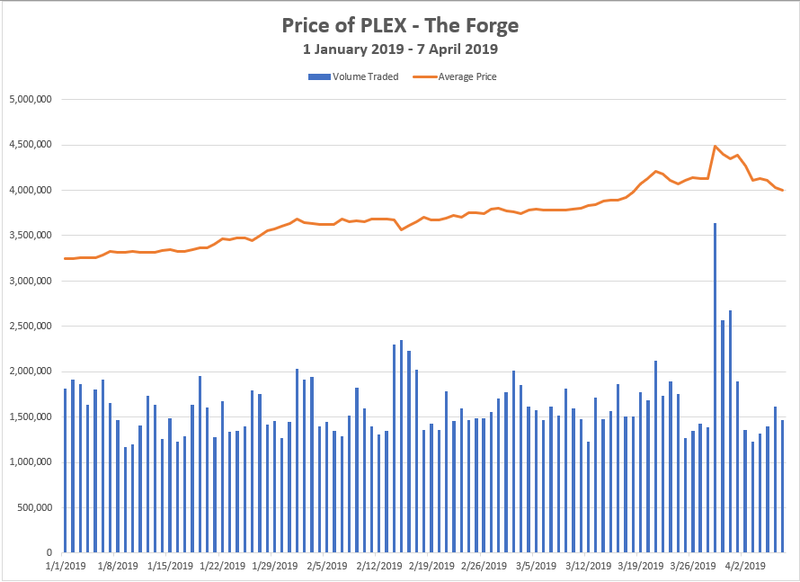 I woke up this morning and ran the script I use to track RMT tokens (PLEX, MPTC, skill injectors and extractors) and saw that PLEX had traded below 4 million ISK in The Forge, with the average price traded 4,001,000.00 ISK. Sunday's average traded price was 10.9% below the all-time high of 4,489,980.00 ISK set on 29 March 2019. 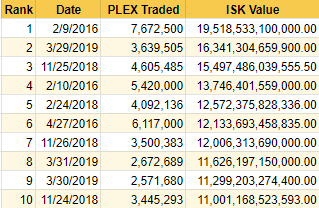 The price of PLEX first traded for an average of over 4 million ISK on 19 March. I'm not sure if today will see the average fall below 4 million ISK, but the possibility exists. My only hesitation is that prices tend to rise during the week and fall on weekends, barring any unusual events like the recent end of the quarter sale. I know I am spending a little too much time on this subject, but I think the psychological significance of players needing to spend 2 billion ISK to PLEX their accounts warrants the attention. Plus, documenting that the recent hysteria over the spike in PLEX prices is amusing. The correction doesn't mean that PLEX is not a good investment. 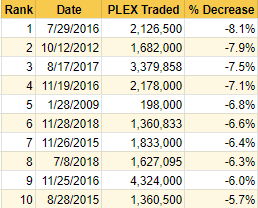 Even with the correction, the average price of PLEX is still up 23.2% for the year. But remember the old saying, "Past performance is not a guarantee of future results." The recent game time sale held from 29-31 March for me highlighted the differences between two groups of players in EVE Online that I describe as whales and remora. Well, when I remember to mind my manners, I refer to them as remora. A whale is a term most gamers recognize by now. Ther term comes from the world of gambling, referring to people who wager massive amounts of money. In places like Las Vegas, whales are often encouraged to maintain their patronage of establishments through the use of free drinks, private jet transfers, limousine use, or access to the gambling establishment’s best suites. In trying to come up with a definition for a whale in an MMORPG, almost all sources led back to free-to-play mobile games. I did find a Eurogamer article covering the beginning of the lootbox gambling controversy that referenced a figure of £25 (~$33 USD) a month as the amount whales spent on microtransactions. Other references to mobile games reference either a total of $100 on a game, or even $100/month spent on games as representing whale-like levels or spending. A study reported on by AdWeek in 2016 placed the about spent by whales at $335/month, with the lesser amounts spent by "dolphins" and "minnows" clocking in at $17.94/month. For purposes of determining the definition of a whale in EVE, I'll define a whale as someone spending over $75 USD on EVE every month. Basically, that covers someone paying for three accounts and buying the 1100 PLEX package for $39.99 every month. Or uses real world currency to pay for 5-7 accounts, depending on payment plan used. I think I can safely label anyone buying 10 billion ISK per month through CCP a whale. If these numbers seem low, perhaps that means EVE is full of whales. While whales is a familiar term, what are remora? A type of fish that attaches itself to sharks, dolphins ... and whales. In the natural world, remora and whales have a symbotic relationship. The remora benefit by attaching themselves to whales, thereby gaining the fast-moving water running through its gills providing the oxygen needed for the fish to survive. The whales benefit because the remova eat parasitic copepods or amphipods that attach themselves to the giant mammals. EVE has a class of players who neatly fit the role of remora to the cash-rich whales. A not insignificant percentage of players don't pay for their subscription time (aka Omega accounts) with real world money. And just as in Terra's oceans, EVE's remora come out ahead. EVE's whales provide the remora with account-sustaining game time by purchasing PLEX from CCP (or an authorized PLEX reseller) and putting the virtual good on the market. In return, the remora purchase the PLEX, thus removing the irritant of having to earn ISK in order to play other parts of the game. In New Eden, as in the Atlantic, a symbiotic relationship in which both sides benefit. The inspiration for composing the previous 450 words was Brisc Rubal's reaction to last weekend's Omega time sale on Friday's Open Comms show. Brisc, a member of the Council of Stellar Management and a self-described whale, was extremely critical of the form of the sale. Instead of taking the traditional route of providing the whales a discount when buying PLEX for real world currency, someone at CCP instead chose to target the remora by offering a discount on the quantity of PLEX needed to subscribe an account for 30 days. 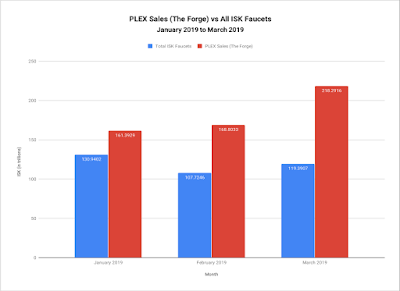 The result of the sale was a run on PLEX that raised the amount of ISK the whales would receive for a purchase, but they would not get a real-life money bargain at the same time. As the show continued, I couldn't help but consider the point that, at least for one weekend, the whales weren't catered to. Normally, CCP reduces the price of PLEX, thus leading whales to purchase more PLEX. The remora then benefit indirectly as the increased supply results in a temporary decrease in the price of PLEX. But the sale that resulted in the highest one-day rise in the price of game time in EVE's history only benefited the whales indirectly, as the increase in price meant the whales received more ISK for their PLEX purchase. 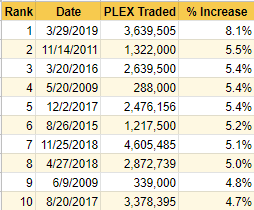 The only question was whether the price increase was temporary, and, if so, how long until the PLEX market returned to normal. I honestly don't think Brisc took the sale as a personal affront at CCP not catering to whales like himself. He brought up other concerns of whales, such as the population of the game decreasing. One of the reasons for developers and publishers adding a F2P option to MMORPGs is to make sure the game world is populated enough to keep the whales happy. After all, if the population drops to a low enough point, why spend large amounts of money in the game? Or, as Brisc alluded to, CCP needs to make sure the whales have something to shoot. I will probably come back to the issue of the whales and the remora again, as keeping both sides in balance, and at least content, is important to not only EVE, but most games as well. While some companies cater to their whales like they truly are high rollers in Las Vegas, hopefully EVE's big spenders will keep those impulses under control. But as CCP continues evolving and growing in the Pearl Abyss era, I'll keep an eye on the behavior of both whales and remora. Normally I don't try to post breaking news. I'm a blogger, dammit, not a reporter. 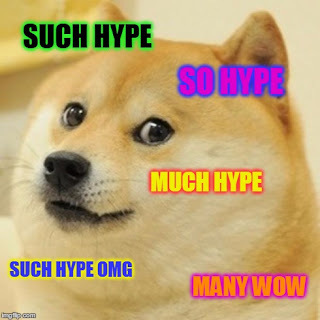 But once again CCP is moving quickly on the public relations front and I probably need to let some people know what will happen tomorrow (March 28), but this weekend as well. First, at 1400 EVE Time on 28 March, CCP's Chief Executive Officer Hilmar Veigar Pétursson will conduct an Ask Me Anything on the official EVE Online forums. Shortly after he finishes with the typed word, CCP Hellmar then makes a planned one hour appearance on the Talking In Stations Twitch channel. Sounds like a full day tomorrow for EVE Online news. So for the event, Alpha characters can gain a total of 75,000 skill points while Omega players can rack up 250,000. Not bad for just logging in. Unlike in some other givaways, players may distribute the skill points to any of the characters on their accounts. I figure giving advance notice of the skill points alone is enough to justify writing this post. But since CCP has sprung Hilmar's appearances with such short notice, I thought I'd also go ahead and spread the word about that as well.